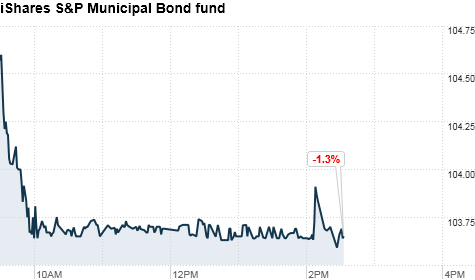 Click the chart to track the popular municipal bond fund. NEW YORK (CNNMoney) -- Investors are still more than willing to buy the federal government's debt, but they might not be so kind to America's cities and towns. In the aftermath of S&P's downgrade of the U.S. credit rating, experts warn that over the next several days the rating agency will downgrade hundreds of municipalities that are rated AAA because their debt is backed by the U.S. government. Since the nation's credit rating was lowered for the first time in history last Friday, the agency must follow up by also lowering the ratings these directly linked municipal bonds. "The one thing to recognize immediately is that it doesn't stop in at the United States," said Mohamed El-Erian, CEO of Pimco Funds, the world's largest bond management firm. "If the sovereign debt is downgraded, those who depend on the sovereign cannot trade higher than the sovereign." That's exactly why S&P began to take action Monday: It stripped AAA ratings from Miami; Tacoma, Wash.; Atlanta Downtown Development Authority; and the Board of Governors of the University of North Carolina. But it won't stop there. By the time S&P completes all the necessary downgrades, it will have affected about $150 billion worth of municipal bonds, or about 3% of the entire muni market, according to Matt Fabian, managing director at consulting firm Municipal Market Advisors in Concord, Mass. While investors understand that the U.S. credit rating is a reflection of macroeconomic or political factors and not necessarily default risk, ratings of municipal bonds are based on default risk alone, said Fabian. "Once these bonds are downgraded, investors will start to sell," he said. On Monday, the iShares S&P National Municipal Bond ETF, one of the most popular muni bond funds in the market, dropped 1.3%. "And as more investors take notice of how much the value of their municipal bonds decline, or how much their municipal bond mutual funds drop, they may believe that their holdings are in trouble and will choose to sell them," Fabian added. It would be the same as the fear-induced momentum selling that took hold after Wall Street analyst Meredith Whitney predicted that the muni market could see 50 to 100 defaults in 2011, resulting in hundreds of billions of dollars in losses to investors. That selling yanked billions out of the muni market in just a few months. But just as they didn't need to panic then, Fabian says investors need not worry about these downgrades. "The financial market is changing, and there will be increased volatility over the next few weeks," Fabian said. "But the default risk of municipal bonds has not increased, so it's better for investors to wait and not do much of anything."